Did you enjoy this short video? You can try this swipe your Givenchy look experience here below. Les Menuires is a French ski resort, situated in the Savoy region of the Three Valleys. Making use of its stunning surrounding mountains, lakes, and landscapes, the resort hosts many activities such as hiking, fly-fishing, and buggy outings. The business wanted to capture more data about their customers, but their initial strategy of having staff situated in different parts of the resort asking for information was proving to be unsuccessful. The strategy was partly unsuccessful as there was no incentive and data was poorly captured (wrong email addresses). 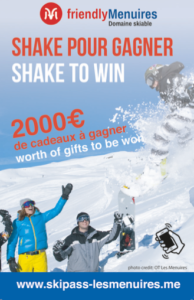 We introduced various mechanisms to capture customer data offline and the team of Les Menuires was very keen to use our shake to reveal module combined with a card distributed at point of sale and other parts of the ski resort. On the card customers would find a unique code that could be entered into an interactive microsite. Les Menuires offered customers a chance to win prizes by shaking their phone, providing that they registered their details together with the unique code to unlock the shake. 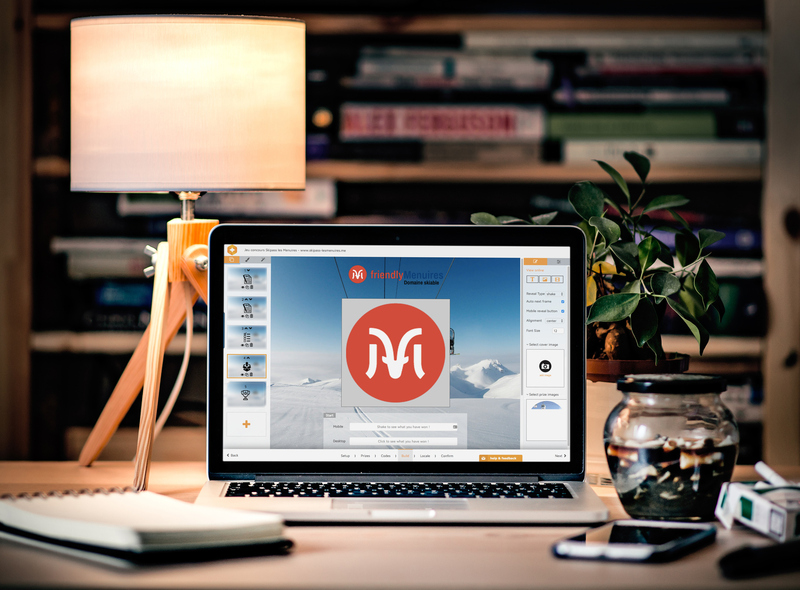 Together with the team at Les Menuires we designed the card and microsite. The combination of a unique code printed on cards and the interactive shake to reveal module created a highly engaging experience for the audience of Les Menuires. This interactive experience was available in English and in French with automatic language recognition based on browser language. Prizes ranged from skis, helmets, ski passes and Roc’n Bob toboggan runs. To spread winning prizes various rules were setup in ODICCI. 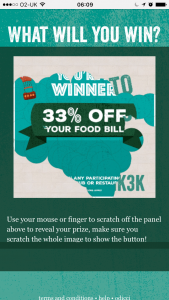 Les Menuires during the season distributed 50,000 cards and managed to interact with 10,327 customers – a great result with more than 20% engagement. Christmas shopping can be the worst thing about the whole season – yes, even worse than the row over who gets control of the TV remote or what time presents should be opened. Would you like batteries? Gift wrapping? Would you like to buy a charity pen with that? ‘Do you have a loyalty card?’ Could I get your email address to send you your receipt? ‘Would you like to register for our newsletter? ‘ No, I want to buy the gift, and then I want to leave. The process can be tedious enough on a normal day, never mind when there are a mob of frustrated Christmas shoppers going through it one by one. Christmas is the busiest time of the year for retailers, but often the data captured doesn’t match the amount of transactions, as stores are too busy to attempt it. With less than a year to go, on the 25th of May 2018, the General Data Protection Regulation (GDPR) will be enforced upon businesses collecting personal data. Failure to comply with the regulation could result in a huge fine of up to 20 million euros or 4% of annual turnover – whichever is highest. Ouch. So, what exactly does GDPR mean? GDPR means that businesses will have to integrate many changes. Some changes will be relatively small, like not using opt-out (pre-ticked) boxes to consent. Some changes will be larger, like giving the identity and contact details of the data controller, and in some cases, hiring a Data Protection Officer. Some of the more general requirements of GDPR are to outline the purpose of the data collection, the legal grounds on which it operates, and specification of how long data will be held. The data collector must outline to the individual their right to erase or rectify their personal data, and make clear to them their right to withdraw consent, and to make a complaint. Data controller: Decides how data is processed. Data processor: Maintains records of personal data and processing activities. The introduction of GDPR means that the top priorities for marketers should be: conduct impact assessments; give individuals more control of their data; and revision of data policies. Despues de la temporada navideña y pasadas todas las fiestas, los pubs del Reino Unido suelen estar completamente vacios durante el mes de Enero. Para combatir esta situación que provoca una bajada considerable en las ventas, Green King, cadena de pubs más grande del Reino Unido, decidio unirse con ODICCI para crear una campaña que conectase con el cliente y consiguiese que estos visitaran los pubs. Greene King quiso ofrecer una experiencia divertida que conectara con los clientes con el objetivo de impulsar las ventas de los clientes existentes y obtener nuevos clientes. Conociendo un poco cual era el tipo de cliente que tenian, ayudamos a Greene King a promover la campaña de digital scratch a traves de una campaña de email marketing a toda su base de datos, en donde los clientes rascaban y revelaban diversos premios como comidas gratis, fitbits, cupones de descuento y muchos más. Los participantes podían incrementar su posibilidad de ganar más premios si compartían la campaña con sus amigos. Esta modalidad provoco que Green King incrementara su base de datos en un 25%. El área de Report de ODICCI , ayudo a Green King a analizar todos los resultados obtenidos en tiempo real. La campaña fue todo un éxito, logrando el premio a la mejor “Estrategia de marketing Multicanal” en los premios Dotties, organizado por Dotmailer, la agencia lider de email marketing del Reino Unido. Greene King consiguió que 730.000 personas visitaron la microsite, 330,000 personas se registraran en la promoción y un beneficio de 700.000 libras . Ellos tambien incrementaron su imagen de marca y cuóta de mercado. Aquí­ puedes descargar el Case Study completo de Green King. ¿Interesado en conocer como ODICCI puede ayudarte? Ponte en contacto o pide un demo. Retailers, ideally, you’ve been warming up your subscribers and generating some early holiday sales over the past month or two, but now that Halloween has passed and it’s November, it’s official: Christmas season is here! 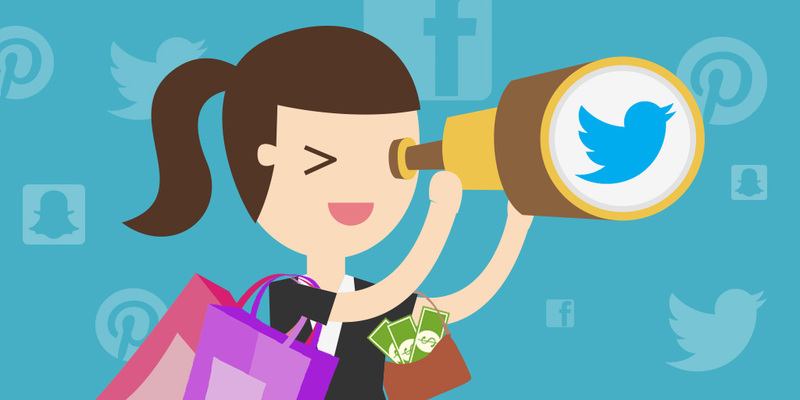 Social media is one of the most important aspects to consider on Black Friday. Every business have many deals for this day and your social media accounts like Facebook, Twitter or Instagram are the perfect way to promote those offers to your customers and drive more sale to your business. Here are 7 ideas to use on Black Friday. 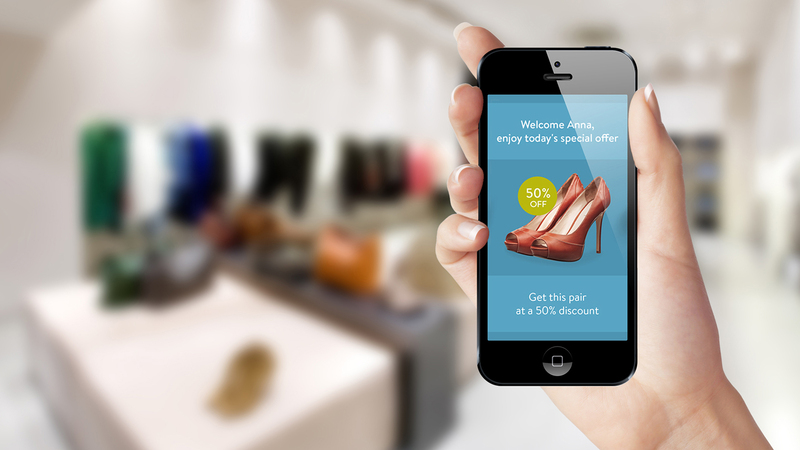 New technology is revolutionising the traditional store concept. We have seen striking progress in technology over the last few years and it is affecting the way customers experience retail. Are you wondering how many people will be coming to your store this Black Friday? The digital commerce consultancy, Salmon, whose clients include Argos, Sainsbury’s or Selfridges, has predicted that Black Friday will surpass £1bn sales this year so that retailers need to take advantage this opportunity to data capture. 1) Intrusive: it can be an uncomfortable experience for customers to disclose personal information at checkout. Customers also often do not have the time. 2) Data quality: names, emails addresses when entered into the system are often misspelled. Wrongly entered email addresses will cause deliverability issues, wrongly entered first name or title will cause customer frustration and disappointment about your brand.